Exceptionally clear, non-blushing, low-VOC epoxy curing agent for use with TotalBoat Traditional Epoxy Resin. Use for clear coating and fiberglass layup applications where a natural wood finish is desired. UV inhibitors enhance durability of varnish finishes applied over it. Sizes: Size A 10 fl. oz., Size B 42.3 fl. oz. Note: Hardener sizes correspond to group sizes of TotalBoat 5:1 Epoxy Resin. The hardener container does not come filled to the top. It contains the calibrated amount of product to work in conjunction with the same size resin container. Each hardener order includes one 3:1 hardener pump calibrated to the proper ratio of one pump of TotalBoat traditional epoxy resin to one pump of Crystal Clear Hardener, pump instructions, 1 pair of large latex gloves, and mixing sticks. After investing money and countless hours building a wooden shell from scratch, you want to choose the best marine epoxy resin and hardener combination for a bright finish or clear coating. Same goes if you’re taking a previous mistake down to bare wood and starting over. Or maybe you want to show off carbon fiber’s cool black-on-black texture. Pair TotalBoat Crystal Clear Hardener with our Traditional (5:1) Epoxy Resin to wet out fiberglass or carbon fiber for layups. It cures to an ultra clear, hard, moisture-resistant finish. Use it to seal wood and create a moisture barrier that prevents stretching and shrinking so varnish topcoats adhere better and last longer. Professional boat builders and painters use such clear resin systems to build thickness faster, so fewer finishing coats of varnish are needed. Get the same clarity as using multiple coats of varnish, with greater protection and finish longevity than using varnish alone. 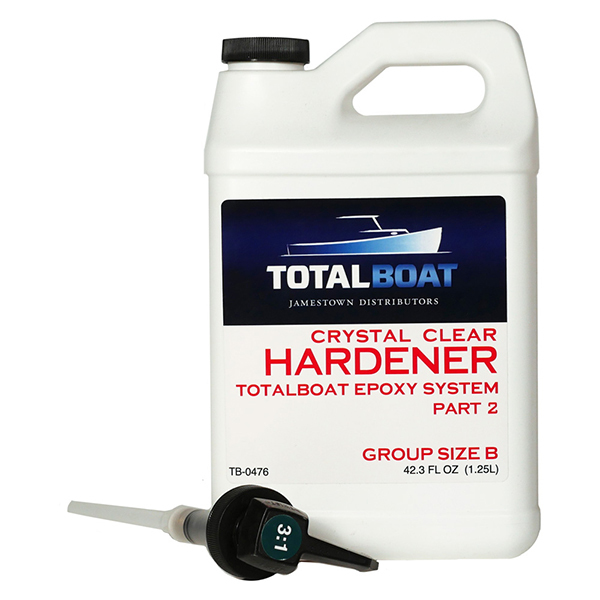 Important note: When using the pumps to measure resin and hardener, ONE PUMP of TotalBoat Epoxy Resin is calibrated to mix with ONE PUMP of TotalBoat Crystal Clear Hardener. Prime this pump by pumping until a steady flow of hardener comes out. DO NOT USE THIS PUMP WITH ANY OTHER HARDENERS. If needed, a replacement 3:1 Hardener Pump is available.